Doctricks helps you to implement OpenText StreamServe Customer Communications and to take control over your output. StreamServe works with all types of customer communication, from a single customer letter in a call center to large volumes of output such as credit card statements and invoices. Email and SMS can also be created and combined with electronic portals such as “my pages” where digital copies of documents can be access around the clock. With StreamServe’s help, you can include static, dynamic or scheduled content such as monthly campaigns, special offers, current affairs and even operational information to help improve your customer relationship. A better relationship with your customer leads naturally to a more satisfied customer and improves the likelihood of additional sales over a longer time. For all business applications, StreamServe can take control over business documents and combine these with auxiliary information from CRM/BI applications to maximize their purpose. Typical business applications used in conjunction with StreamServe include SAP, IFS, Lawson, Infor, AX, NAV and many in-house apps. StreamServe can also be connected to cloud bases services to utilize service-based architecture. Doctricks, with StreamServe, can help you get control of your outbound documents. A common problem with document management, for companies and organizations, is the inability to build, administer and control customer communications in the day-to-day business. Often, these changes do not belong to daily routines and require special effort from IT technicians. Doctricks helps you to get the most benefit from your StreamServe implementation. 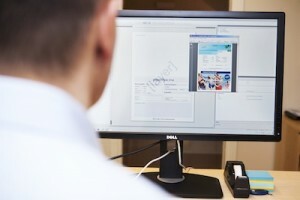 Modern document applications should increase sales, customer loyalty, reduce costs for Print Shop suppliers and improve your environmental impact. Engage your customers – give them personal relevant information weather it’s one-to-one communication or large volumes of mass-produced documents. Simplify and automate document composition and administration – streamline document related business processes to reduce costs and increase operational speed. Empower your users – your colleagues will receive practical control over their documents and dispatch methods required to drive the business, you do not need to involve the IT department every time a document is to be changed. Simplify business processes – weather it’s about communicating with customer or suppliers, internal document-flow or easing payments and earnings. For a customer in Financial Services, StreamServe was used to create contracts with dynamic layouts based on end product and receiver. Documents can contain signature functions to ease customer experience and speed up business processes. A customer within telecom uses StreamServe’s high performance capabilities to produce millions of Welcome Letters, Contracts, Monthly Bills and Reminders at the same time as adhoc email and sms/Text messaging is sent from the system. Within the Print Shop industry, we have a customer using StreamServe to co-envelope, postal fee optimize, generate OMR, select designated attachments and perform print stream data conversions for printer press routines using paper sheet, roll and envelope operations.